The question comes up often. Why do we memorize so much information in Classical Conversations? I have addressed the topic of memorization often in the past few years, and I am gathering all my links and quotes in this post for the sake of convenience. Later this month I will share a bit about the structure of our days this year and what we are learning and memorizing, or taking to heart. There are times when memorization is out of favor in education. Some might say that “rote memorization” is not appropriate as a teaching strategy. “Rote memorization,” however, is loaded language, biased against the discipline and effort required to learn things permanently. There is nothing wrong with challenge. 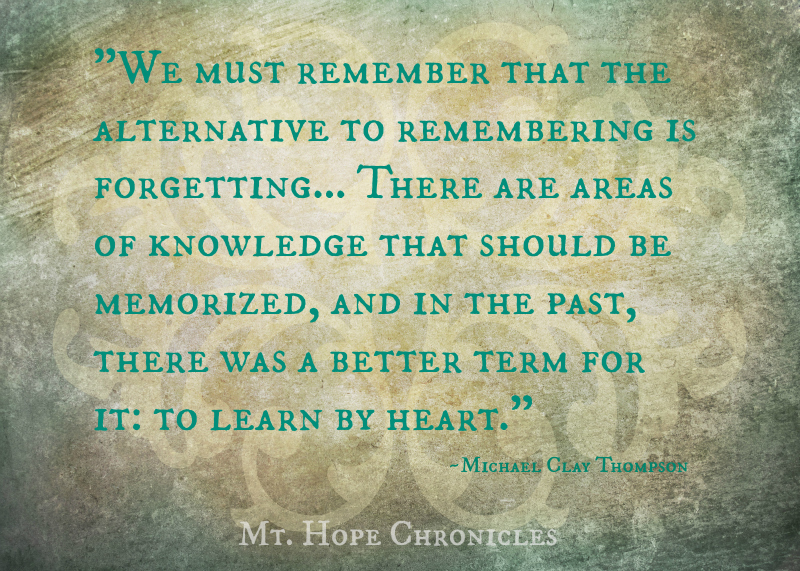 We must remember that the alternative to remembering is forgetting, and when we teach something as important as grammar, that will be needed for one’s entire life, the ban on memorization makes little sense. There are areas of knowledge that should be memorized, and in the past, there was a better term for it: to learn by heart. I watched this documentary when it was released. It brought me to tears. And it solidified my desire to have my boys memorize—poetry, speeches, Bible passages, history timeline, geography, prayers in Latin—not just because I want them to have the information at their fingertips, but because I want them to enlarge their hearts, to practice doing hard things, and to engage with ideas to the point of personal ownership. Where we fail is in thinking that memorizing is an end. Rather, it is a doorway that leads to an exciting world. It is a sense of accomplishment for kids. It empowers them. It gives them a chance to practice delivery in front of people—a huge skill. It is an introduction to big ideas. It is sophisticated vocabulary and language patterns embedded in their minds. "[Memorization] serves a huge purpose. We're all sitting here wringing our hands at the sorry state of education. Everybody has got ideas: You've got to do STEM, and all of a sudden you've thrown the baby out with the bath water of humanities and arts and history. Nobody teaches civics anymore. People dismissed memorization 40 or 50 years ago as rote. It's not that; these kids prove it's not. "I think the fact that we have completely tossed out memorization is a huge, huge flaw. Who knows, maybe that and civics are the glue that hold everything together? Civics is in fact politics, and politics is how things work not only in the political realm but in every other realm. It may be this simple mechanical glitch that unites everything. This is my philosophy." "Without memorizing some information, it’s harder for the brain to acquire new knowledge and skills. It takes longer for the brain to process new information, and students are less likely and slower to ask informed and perceptive questions. "Creativity draws from many powers that we all have by virtue of being human. Creativity is possible in all areas of human life, in science, the arts, mathematics, technology, cuisine, teaching, politics, business, you name it. And like many human capacities, our creative powers can be cultivated and refined. Doing that involves an increasing mastery of skills, knowledge, and ideas." “Memorization allows scholars to warehouse, if you will, a stockpile of concepts. Important background information will only help learners throughout their lives. 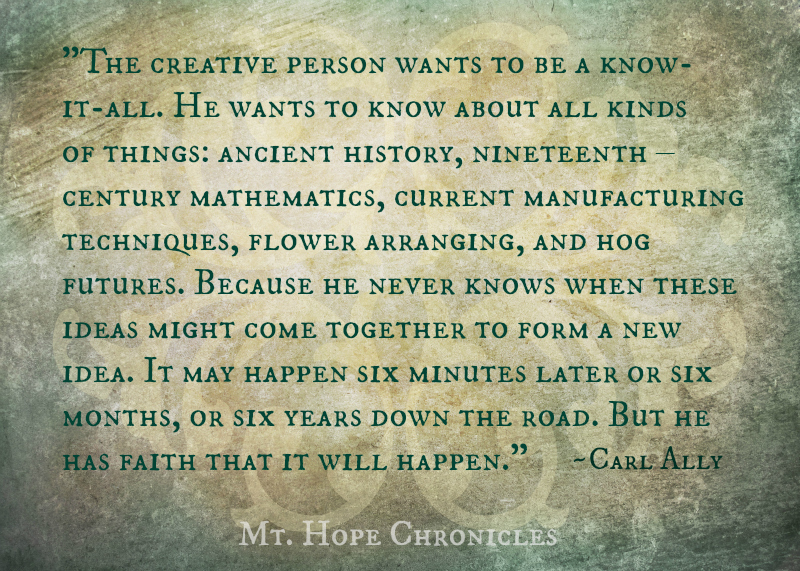 Also, the creativity process is a mysterious one. The more useful concepts that students have stored, the easier it is for their minds to sift through their "files" and allow them the satisfaction of discovering new ideas." But I think they also knew that memorization allows things to become a source of future contemplation. When we memorize something such as a poem or a song, we have the ability to more deeply reflect on it, to understand it more fully as time goes on. Knowledge then no longer merely remains external to us; it becomes a part of us. We become knowledge. "But the very final pleasure is what I called “the pleasure of companionship”—and this was a way of talking about memorization. When you internalize a poem, it becomes something inside of you. You’re able to walk around with it. It becomes a companion. And so you become much less objective in your judgment of it. If anyone criticizes the poem, they’re criticizing something you take with you, all the time." "I think I read recently that we’re not suffering from an overflow of information—we’re suffering from an overflow of insignificance." If you don’t know where to start for poetry memorization, may I make a few recommendations? We have many books of poetry (I particularly like the Poetry for Young People series), but my favorites are poetry recordings that we can listen to in the car or during quiet time. I’ve found that this is the best way to get the words and sounds of the poetry embedded in our minds. Poetry Speaks to Children is a book of child-friendly poetry that includes a CD of poetry readings—most by the poem authors themselves! A Child's Introduction to Poetry: Listen While You Learn About the Magic Words That Have Moved Mountains, Won Battles, and Made Us Laugh and Cry is just that. Part 1 introduces different types of poetry, and Part 2 contains a chronological introduction to many famous poets. (The illustrations are quite entertaining.) The accompanying CD is a treasure. Many of the poetry selections are wonderfully spoken by two different narrators (a man and a woman, so the recording doesn’t feel monotonous). If you think that memorization is boring, you might enjoy the following video. No, we don’t have a two-story electric blue slide at our CC location, but our students enjoy singing and dancing (occasionally while standing on chairs) while practicing their memory work and my boys have been known to use a mini trampoline at home. Wow, thanks for all these great resources! I've been memorizing hymns with my five-year-old, and it's been great to hear him starting singing the words at various times. Though I recently realized that he'd memorized "Holy, Holy, Holy" as having the line "early in the morning/our sun shall rise to thee"! I guess the image of a sun rising is much more familiar to him than a song rising! 1) I was ready to kiss you when I saw your link to a CD with RLS poems swt to music. I checked out a similar CD from a library in another state 10 years ago. I have frittered away countless hours on search engines in the meantime, trying to find a copy of that CD (or was it a cassette tape?) to no avail. But alas this is a different one. I am sure this one is lovely, too, though. 2) We have used Andrew Pudewa's poetry curriculum for years. Some of your readers might like to check that out as well. I can even come close to following the pace set out in the curriculum, but it really helped to give us a starting point. 3) As I was listening to the excerpts from the CD a thought occurred to me. Do you think it somehow lessens the value of memorizing a poem when it is set to music? It almost feels like song memorization and poetry memorization are 2 different kinds of memorization for 2 different purposes. Songs are a great memory tool, but to some extent they can also be a crutch. Anyway, I certainly don't mean to criticize, but I thought I would ask if you have ever thought of it that way? Thanks again for your blog. I love all if your posts. Meredith, Magggie, and Sander~ 1. That's kinda funny because I checked out the one I linked from the library years ago and was so excited to find it again! I'm sorry it wasn't the one you were looking for! :( 2. Yes, I really do like Andrew Pudewa's poetry curriculum. I'd say the only drawback is that it's difficult to hear those poems NOT in his voice. ;) 3. Yes, songs can definitely be a crutch at some point. BUT, I do like them occasionally, especially for poetry and Bible passages and especially when the songs themselves are beautiful--just like we have poetry in hymn form. :) Music is formative as well, and I love those RLS and American poet songs as well as many of the songs from Sing the Word. Heidi -- thanks for all of this research and evidence. I'm saving your post. It's really great!